In December, “Bus & Car” magazine dedicated a feature article to CBM. 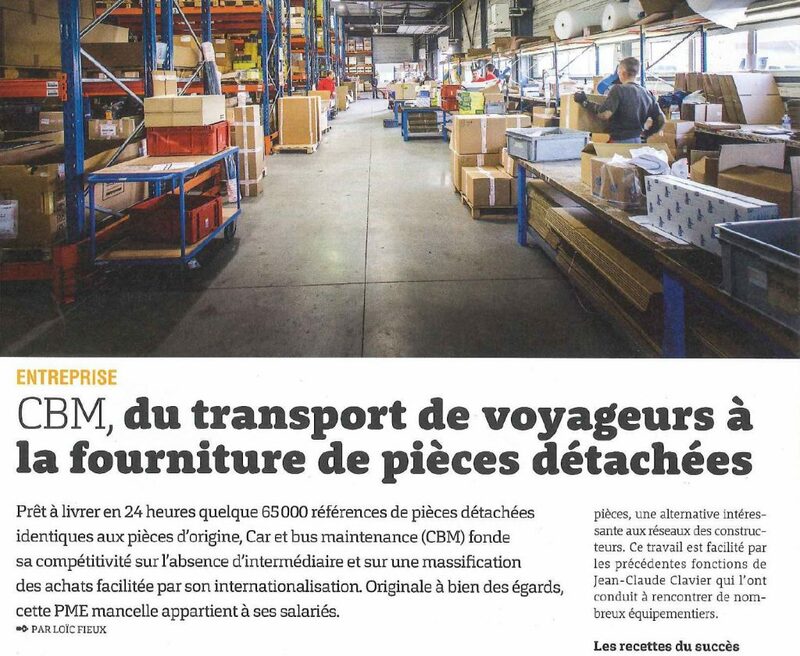 Entitled “CBM, from passenger transport to the supply of spare parts”, the article takes stock of the unparalleled path followed by the company, its differentiating offering and the Group’s international dimension. Alongside Busworld Europe 2017, “Bus & Car” magazine included an interview of Alain Fauconnet, CEO, and Robert Khanoyan, Marketing Director of CBM. The result is a comprehensive feature article published in edition no.1037 (15 – 29 December 2017), which traces the unique path taken by CBM since its creation in 1977, with light shed on all of its strengths. Product stock. Chassis and suspension, Axles and steering, Engine and the environment, Gearboxes and clutches, Bodywork and equipment, Electricity and visibility, Braking. Our teams distribute a range of 65,000 products, specifically adapted to the maintenance of passenger transport equipment, across the globe. Responsiveness. We guarantee daily deliveries within 24 to 72 hours. Across Europe, any order confirmed before 16:00 will be delivered before midday the following day. Such short turnaround times are only made possible through our eight efficient logistics platforms located in Europe, North America and Australia – with the latest one having opened in Poland in December (see article: “A new warehouse for CBM Poland”). The team. CBM’s major shareholding is its own employees (60%), which ensures the stability of its operational teams, who are spare parts specialists. This also facilitates the building of strong partnerships with our customers, based on transparency, responsiveness and expertise. Suffice it to provide a little more information about CBM, your spare parts specialist for coaches, buses and trams!